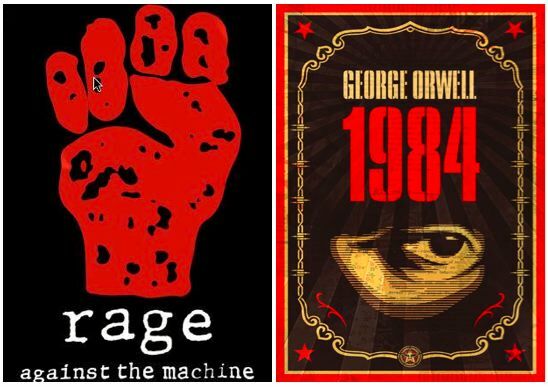 George Orwell’s famed novel 1984 is one of my favorite mandatory reads from high school. I have always found it difficult to recall specific quotes from classic novels off-hand. But one quote from this book has never been far from the front of my mind (perhaps for its persistent relevance, perhaps not): “Who controls the past controls the future. Who controls the present controls the past.” Rage Against the Machine helped to reveal the relevance these words had in the contemporary state affairs with their song “Testify,” in which one word, “now,” was incorporated after the words “past” and “present,” effectively emphasizing the frightening parallels between a fictional totalitarian state and a functioning “democratic” government. I remember watching RATM in the news when I was in high school (2000). While filming a music video in Manhattan for their song “Sleep Now In The Fire,” RATM managed to shut down Wall Street for half a day by occupying the area around the NYSE. I remember my parents rolling their eyes as I tried to suppress my reaction to what I had just witnessed. While my parents perceived these musicians as uneducated and dangerous, I thought RATM was inspiring and clever, and I found it refreshing to be exposed to American citizens critiquing American capitalism. Presently, with the emergence of the Occupy Wall Street protests, I am again witnessing a form of political dissent similar to that displayed by RATM more than a decade ago. When I first heard about the Occupy Wall Street movement, I had little faith that the initial demonstration would last more than a few days. But I did experience a feeling similar to that which I had experienced in high school. It was refreshing to see people taking an active interest in the state of affairs. As the movement continues to last, and spread throughout the country (and world), I spend more and more time reading and talking about OWS. I have found that the most interesting conversations concerning the movement focus on criticisms OWS has received in the media. When I asked what people thought about the movement, one individual replied, “I think all of those people are idiots. I mean, seriously. Take a basic economics class before you go spouting off on how to solve problems with the unequal distribution of wealth.” This individual was about to receive her MBA, so I wasn’t too shocked by her stringently conveyed objections. But even people I assume to be supportive of OWS have become increasingly bothered by the lack of clear and concise demands. Maybe my background in political science and protest politics contributed to my supportive stance on the movement. 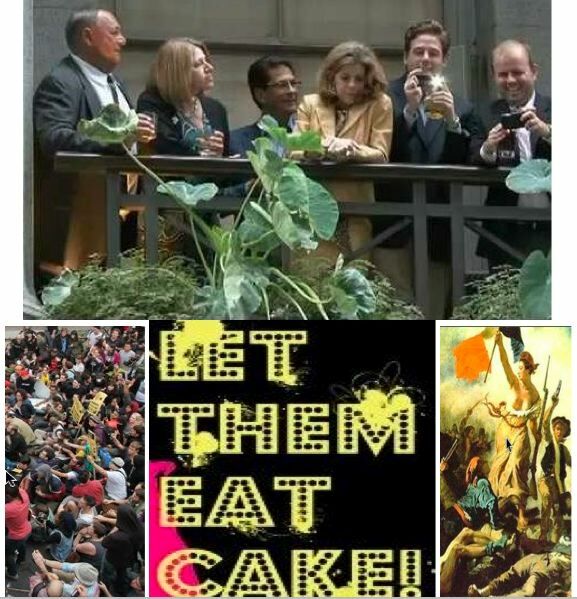 I could not help but to hear the phrase “Let them eat cake,” playing in my mind repeatedly as I witnessed more examples of upper-class extravagance in the face of such widespread middle and lower-class suffering. I saw so many parallels to the French Revolution (the state’s financial crisis, the upper class resistance to taxation and the impotence of the monarch to enforce this, the struggles of the lower class and the failure of the state to effectively assist this class–the largest in the country). I can understand now more than ever how the political, economic and social unrest of that time came to a boiling point resulting in violence. I found myself debating with friends and colleagues whether a list of demands was even necessary for OWS. Isn’t a relatively peaceful demonstration on such a large-scale enough? I guess I viewed OWS as an effective visual representation of the systemic failure of the current political/economic system. When the opportunity to work on a documentary examining OWS emerged, I jumped at the chance to be involved and to hopefully gain a deeper understanding of the movement in the process. Since documentary is a medium that allows for some artistic/poetic license, while simultaneously maintaining a position of authority and legitimacy, it seemed a perfect means to address so many of the criticisms and questions concerning OWS. More specifically, I was excited at the prospect of producing media that could address the issue of “demands.” Admittedly, I had found it difficult to explain (in words alone) why it was that I felt a list of demands would be superfluous at best (and detrimental at worst), to the ‘success,’ (for lack of a better term) of OWS. During the production process, my group members and I agreed that addressing the issue of “demands” was a central concern. As supporters and/or participants of OWS, we wanted to create a piece that would present an internal point of view responding to the mainstream media’s critiques and their persistent demand for demands. Using raw footage and news clips, and asking questions we had in our own voices, we were able to do so. What I enjoyed most during the production process was our tactic of utilizing mainstream media footage originally intended to critique or undermine OWS to effectively bolster the legitimacy of our supportive stance on the movement. I agree about using the mainstream media against itself but this reminds me of an ongoing fight I had with a fellow AIDS activist videomaker who suggested that altnerative mediamakers should never use dominant images because they always retain some of their pull, strength, and well, dominance. Not sure I agree entirely, but I do think about this alot in relation to remix video. Interesting. I wonder how your colleague would respond to the idea that by NOT utilizing such a tactic (mainstream media to critique itself) we could be doing one of several things: a) legitimating mainstream media’s dominance, (b) assuming, in an elitist fashion, that most people won’t understand the critique, or finally (c) undermining our own position by leaving it out and revealing our insecurities (ie: not having enough confidence in our own position to pit it against mainstream).